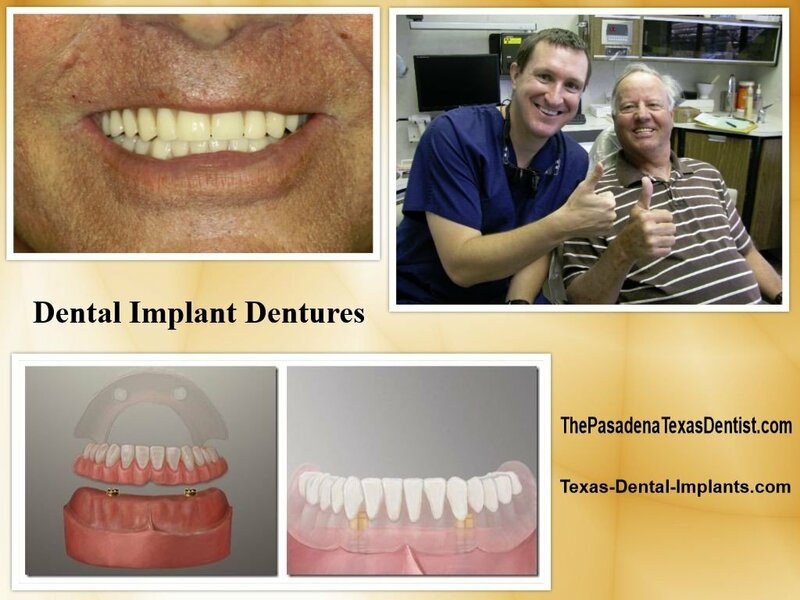 Dr. Nugent offers Implant Dentures at his Pasadena, Texas Dental Office. Dental implant dentures change people’s lives. For patients struggling with uncomfortable or loose-fitting denture, stabilizing it with dental implants is a life changing experience. Dental implants are placed in the jaw where they fuse with the jawbone. Now the implants can act as anchor points for the new implant dentures. When placed in the mouth, the implant denture snaps onto the implants, keeping it stable and secure. What are the benefits of dentures supported by dental implants? Patients who get for implant dentures are more self-confident when they talk, laugh, and eat in public. They never worry about their dentures slipping or falling out while eating or talking. Implant dentures are more comfortable because they are secure and stable. There is no movement and no rubbing the gum tissue raw. No more painful ulcers caused by loose dentures. Implant dentures are more cosmetic because then old fashioned dentures because less acrylic is needed for retention. Eat the foods you love with secure implant dentures. Dental implant dentures preserve jawbone. Chewing forces are transmitted down the implant into the bone. This stimulates the bone keeping the jaw bone healthy. Patients with old fashioned dentures have troubles speaking clearly. Slurred speech and clicking noises are common problems. These problems are from mobile dentures. Dental implant dentures are secure. With implant dentures there is no need to use denture adhesives. Get stable and secure dentures by incorporating dental implants. Never worry about your dentures falling out causing extreme embarrassment. Eat the foods you want to eat. Reclaim your life with dental implant dentures. Visit our office at 3421 Burke Rd Ste A, Pasadena Texas 77504 and change your life.